The Tims Ford Blueway is designed to meet the growing population of paddlers in the area. Tims Ford Blueway is a water trail on Tims Ford Reservoir that is being developed in conjunction with Tennessee blueways. 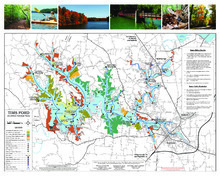 The City of Winchester had partnered with Franklin County Government, City of Estill Springs, TDEC and Tims Ford State Park, TVA, TWRA, Tims Ford Council, South Central Tourism and other agencies in the development of the blueway. The project was made possible throught a recreation grant through TDEC.